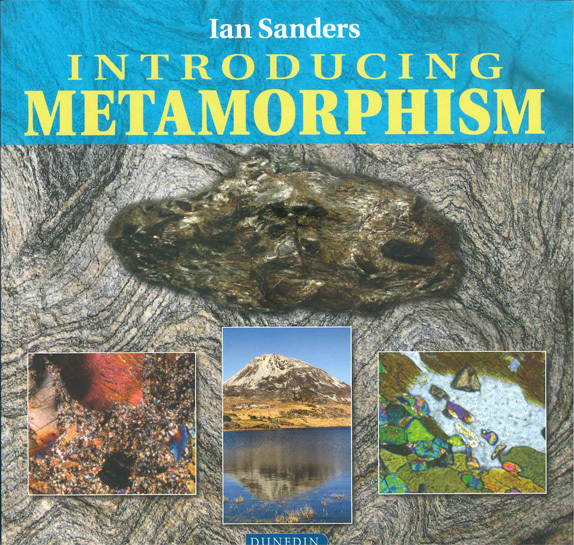 A new book, Introducing Metamorphism, written by Ian Sanders of the Department of Geology, was recently published by Dunedin Academic Press. ‘Introducing Metamorphism’ was written specifically to be understood by those with an amateur interest in geology. However, its accessible style should also make it an excellent introductory text for undergraduate students preparing for a degree in geology or Earth sciences. The book is published in paperback, it has 157 pages with an attractive 217mm by 217mm page size, it is copiously illustrated in full colour, and it is affordable (the list price is £14.99). The first two of its five chapters are mainly descriptive, while the remaining three focus on interpretation. It includes many original diagrams that explain metamorphic processes. A novel feature of the book is its inclusion of images of metamorphic rocks as they appear through a microscope and these images can be followed up online through the Open University’s Virtual Microscope collections. Background material in specially written appendices covers the Earth’s interior, the chemical formulae of minerals, microscopy, X-ray techniques, and geochronology. All technical terms are explained as they arise, and they are also included in a glossary at the end of the book. A pdf of selected excerpts from the book can be found here. It includes the full contents and first chapter along with short pieces from each of the other chapters.